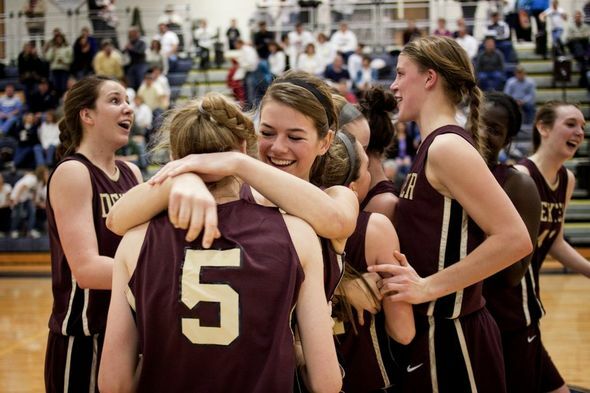 Posted on Fri, Feb 10, 2012 : 10:44 p.m.
Dexter players Annalise Dobbs and Riley McDonald hug after a 32-30 win at Chelsea Friday night. It was the Bulldogs' first loss of the season. Dexter High School players and fans waited a long time for the Dreadnaughts to take their first lead in a girls and boys doubleheader against rival Chelsea. When they did, the advantage lasted all of 30 seconds. But the second lead set off a series of events that was well worth the wait. Despite trailing the entire game up until there were two minutes left, the Dexter girls used a basket with 20 seconds left to slay the previously undefeated Bulldogs, 32-30, and then watched as their boys' team won in a route, 49-30, giving the visiting Dreadnaughts a sweep in enemy territory. In the opener, it came down to three baskets. Dexter junior Emma Kill’s basket with 2:02 left capped a 6-0 run, giving the Dreadnaughts a 29-28 lead. Up until that point, they had kept the score within 10 at all times, but hadn’t led the entire game. Dexter switched to a press defense near the midway point of the game, which generated a few turnovers as the game slowly became within reach. But despite battling back the entire game, Dexter gave up its lead just a half minute later. Chelsea’s Riley Singleton banked a shot off the glass to retake a one-point lead, setting off a near-riot in the student section which had become packed in anticipation for the boys’ game. Kill was supposed to be guarding her. The Dreadnaughts pushed the ball up the floor. Dexter coach Mike Bavineau chose not to call a time out. Guard Riley McDonald dribbled to the corner before sending a bounce pass to Kill, who was standing wide open near the free throw line. Kill calmly sank what would turn out to be the game-winner with 20 seconds left. The shot, plus late a free throw from McDonald, gave the Dreadnaughts the game and revenge. Dexter lost its own chance at an undefeated season in a four-point loss to Chelsea three weeks before. For the Bulldogs, the undefeated streak ends at 15, despite a game-high 10 points from Bailey Darwin. But Chelsea coach Todd Blomquist doesn’t see that as a bad thing. He told his team after the game that it was “probably good for us,” saying that the goal was to not to go undefeated but to win the league. To him, the loss provides a valuable lesson. “We need to have a little more poise down the stretch,” Blomquist said. Dexter's Jacob VanHoof looks to pass against two Chelsea defenders during the Dreadnaughts' 49-30 win Friday in Chelsea. Almost as soon as the dust was cleared and the lessons were learned from the first game, the Dexter boys were putting an end to any doubt in the finale. After falling behind 4-0 to start the game, the Dreadnaughts went on a 15-0 to cap the final five and a half minutes of the first quarter. The margin slimmed to six in the second quarter, but Dexter extended its lead to 13 by halftime and ran away with the game from there. Senior Jay Lewis led all scorers with 16, while Jacob VanHoof and Mioduszewski added 10 each. “I was anticipating a run, but they never got hot,” Swoverland said. Swoverland was proud of his defense for preventing that run by taking away Chelsea’s three biggest scores. But for the Bulldogs, it was just one of those nights. They shot just 3-for-26 from the field in the first half. With Dexter in town, the Chelsea student section devised a plan to sit quietly until the Bulldogs scored their seventh point, then once it was scored, to go crazy. They didn’t erupt until a minute and a half into the second quarter.